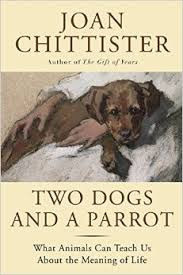 Lady is one of the "stars" of Sister Joan's new book, Two Dogs and a Parrot: What animals can teach us about the meaning of life. However she seems unfazed by her newfound celebrity. Despite a cage full of toys, note that she is on her back trying to grab her "favorite" toy: the toilet paper roll. This gives new meaning to "adapting to your environment"! 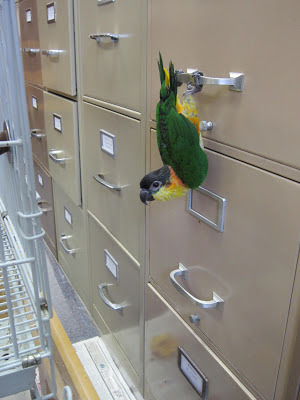 As she spends quite a bit of time in an office during the work day, Lady loves the "juggle gym" of climbing files. This particular trick is detailed in one of the chapters in the new book.